Even though bridesmaids seeme to be an (unnecessary) American wedding tradition, I realized over time that I actually want them to be a part of my wedding day. Not so, to give them the usual duties that bridesmaids carry out – to be my support on my wedding day, to help me throw the bachelorette party, to walk me down the aisle in matching bridesmaids’ dresses or to help me with the whole wedding organization before and during the wedding (I have an amazing wedding planner to help me, so there’s no need for that), – but mainly to incorporate my closest friends into my ceremony. For me it’s is all about making my closest ladies part of my special day. I decided to have my bridesmaids, because I know it’s always more fun doing things in a good company. And because their presence means a lot to me, and I was sure the role of bridesmaids will be equally special and rewarding to them. I chose five outstanding ladies, whom I am happy and very proud to call my friends. Each of them means a lot to me. Who they are and how I surprised them with bridesmaids gifts, you can see below. My 5 bridesmaids – who they are? 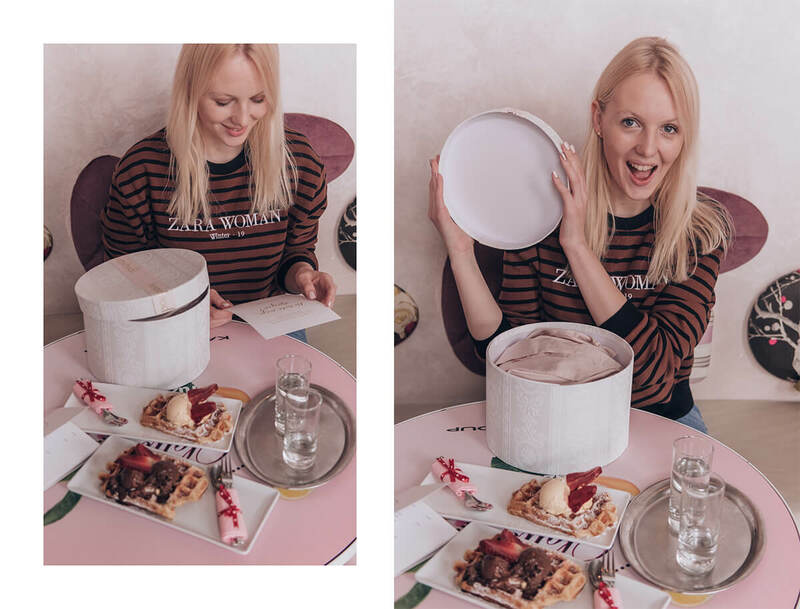 First spot was a no-brainer for me – it belongs to my younger sister Alja, who will also be my maid of honour. Aida and Gala have been one of my closest friends since high-school – when we weren’t sitting together in the classroom, we were chatting about life, goals and random things at the café nearby (sometimes instead of being present at the lectures, just don’t tell anyone haha). The last two spots were reserved for two of my friends who I met because of my blogging career. None of them expected the question “Will you be my bridesmaid?”, so the surprise was even bigger for them. I am really bad at keeping surprise secrets, but this time I really outdid myself (I am really proud of how everything turned out). 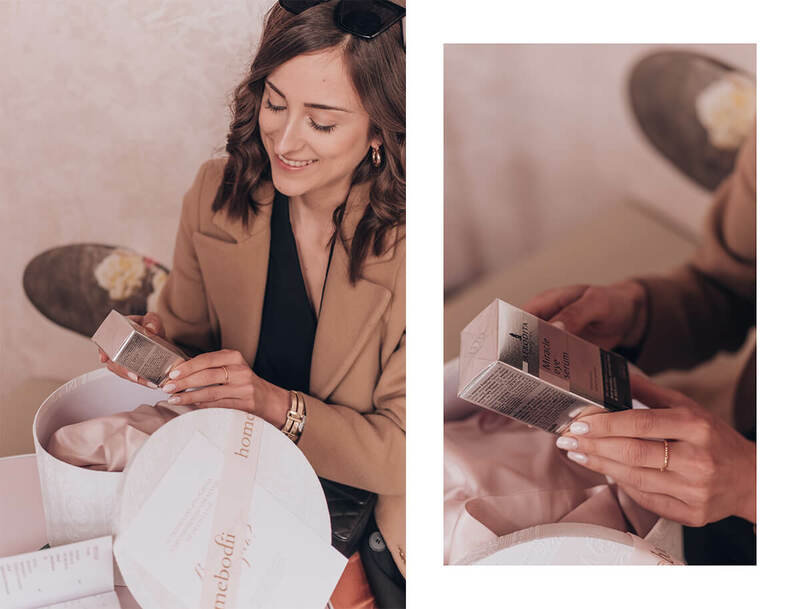 Both Ajda and Tesa were so surprised, when I gave them their bridesmaids’ gift boxes! 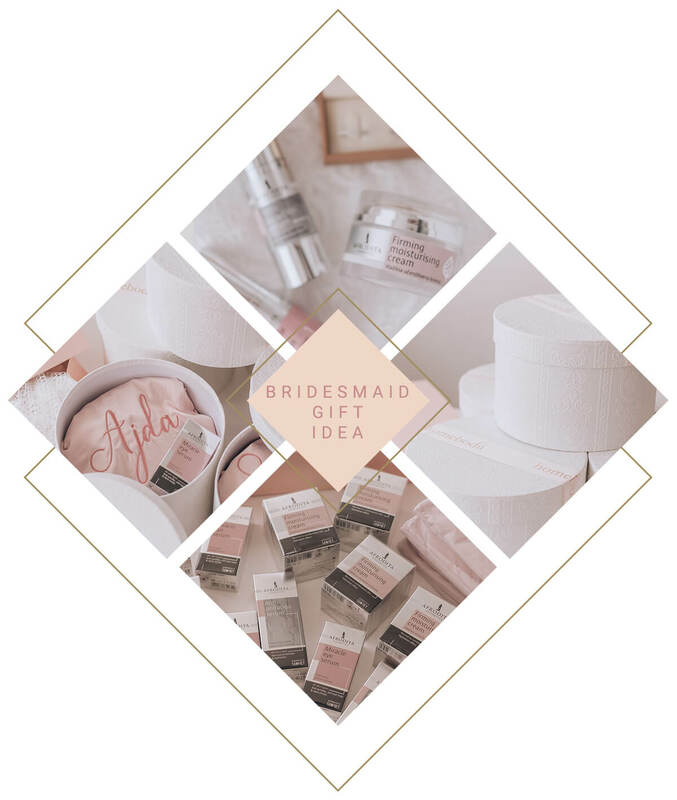 Bridesmaid gifts – how I surprised my bridesmaids? 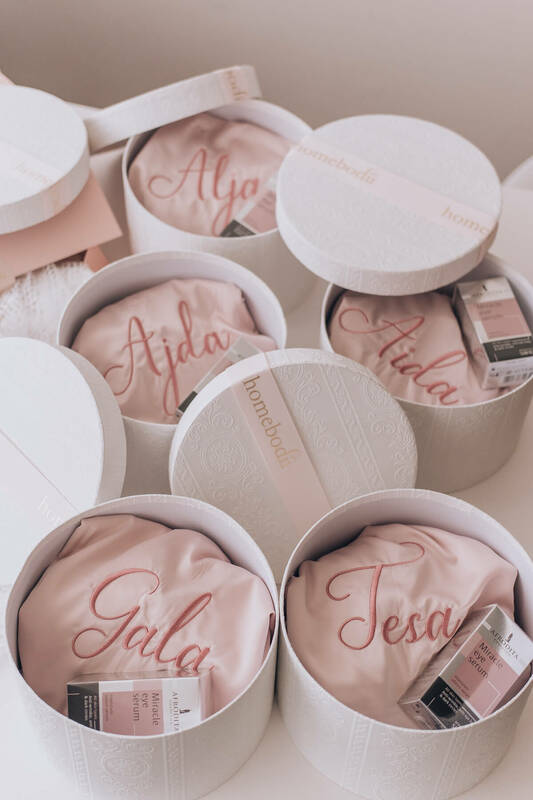 While browsing the internet, I found many bridesmaid gift ideas, checking out Pinterest I obviously also saw a lot of photos of matching bridesmaid robes and I knew I wanted to find some that are well made. 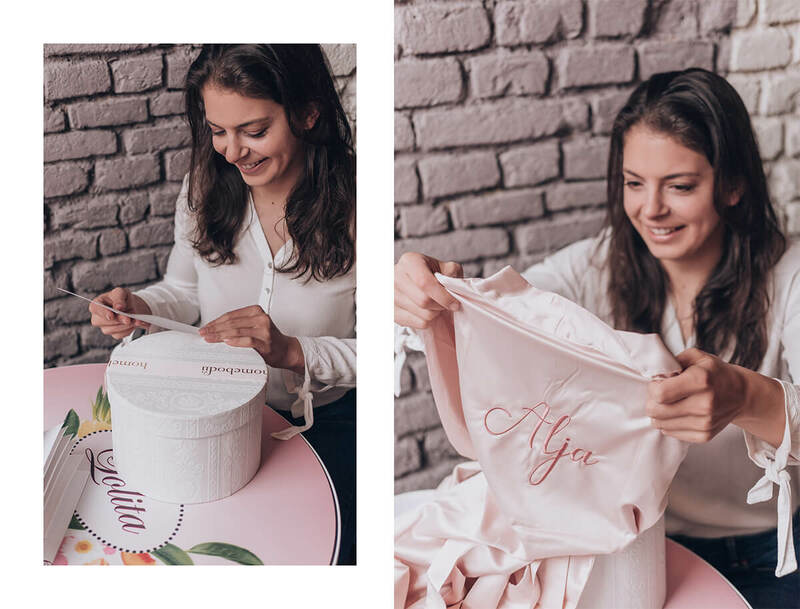 I wanted to give my bridesmaids something to wear on my wedding day, but also I wanted to gift them silky satin robes they would love to wear later in life as well. 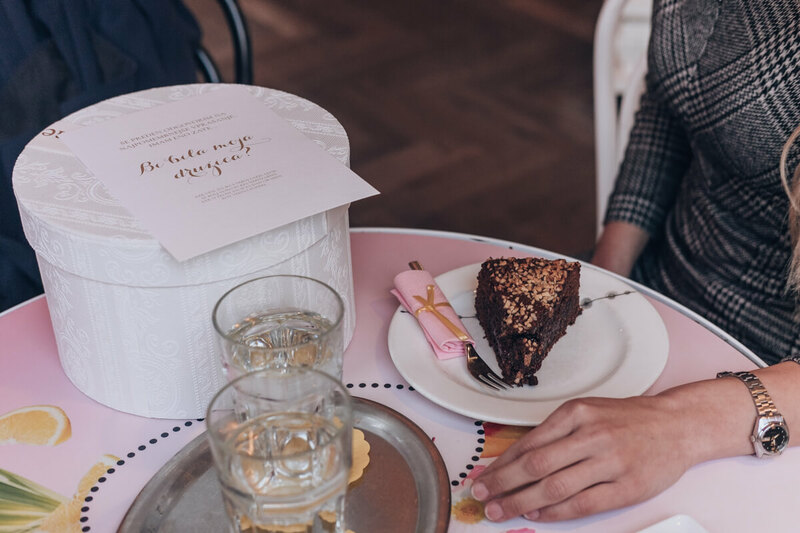 I wanted to gift my bridesmaids each separately and I invited them to an afternoon tea and cake. 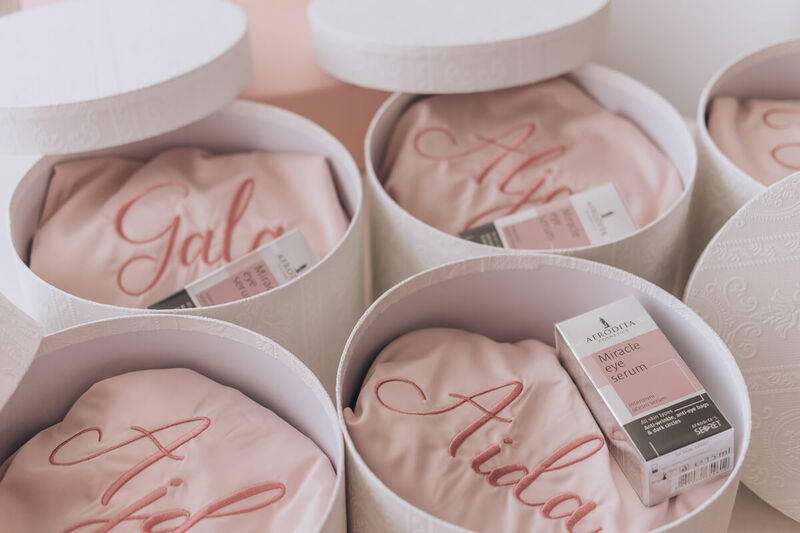 I gave them the surprise box with a question card “Will you be my bridesmaid?”, a personalized robe and a set of three lovely skincare products from Afrodita Cosmetics. 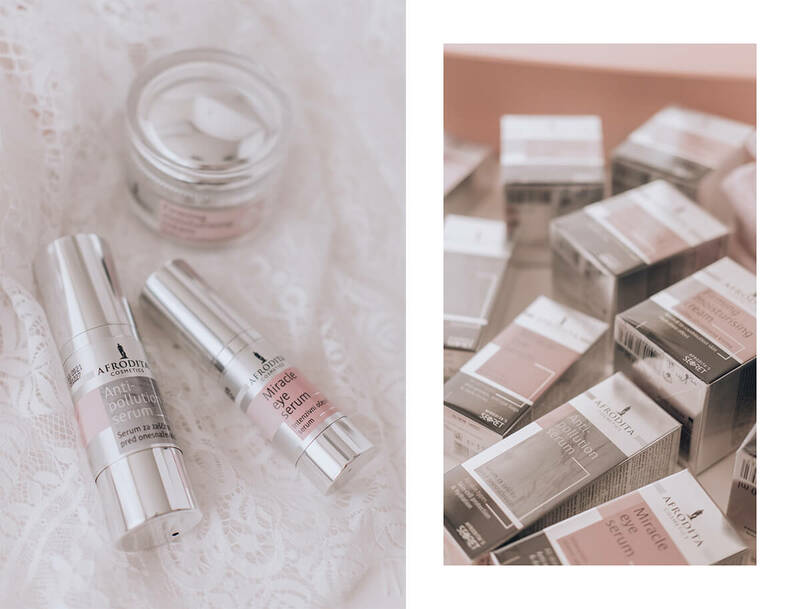 I knew I had to include some skincare products and the first brand that popped into my head was my favorites Slovenian brand Afrodita Cosmetics. 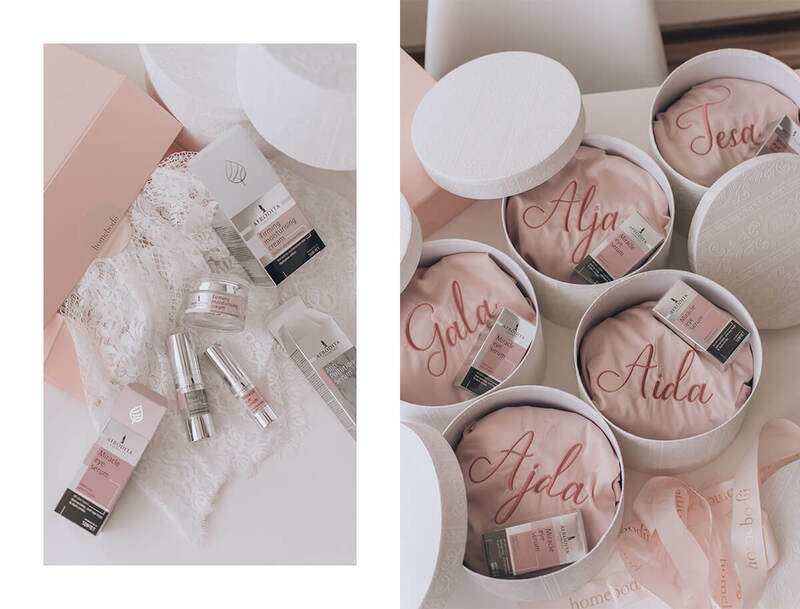 They really know how to make effective skincare, I always find many amazing products, and I wanted all the best for my bridesmaids. Afrodita’s new skincare range Afrodita’s Secret was ordered for this occasion. Pretty on the outside, matching my wedding colour scheme with a stunning packaging! 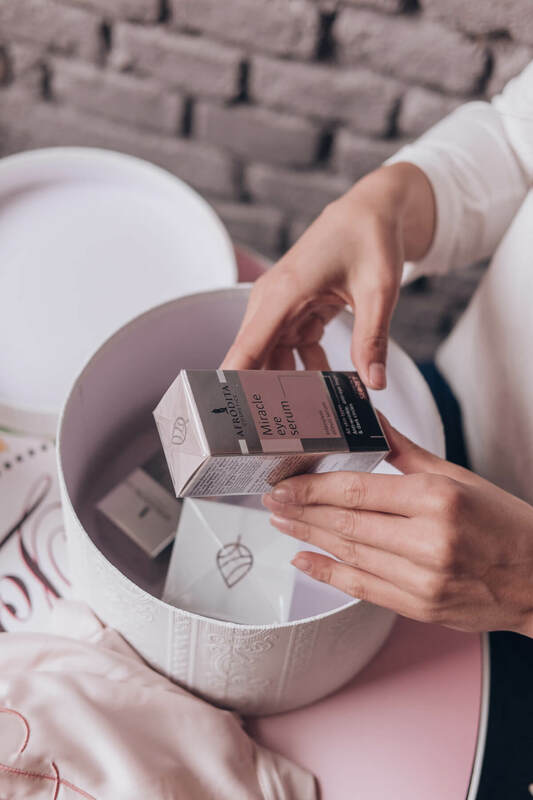 Not that the outside is the determining factor when I shop for skincare (but, let’s be honest, I am always up for some eye-candy packaging on my bathroom shelf), I am well aware the inside is what matters. I checked the ingredients and the story behind the Afrodita’s Secret range, it checked all of my boxes and I knew my girls will be gladly using it. 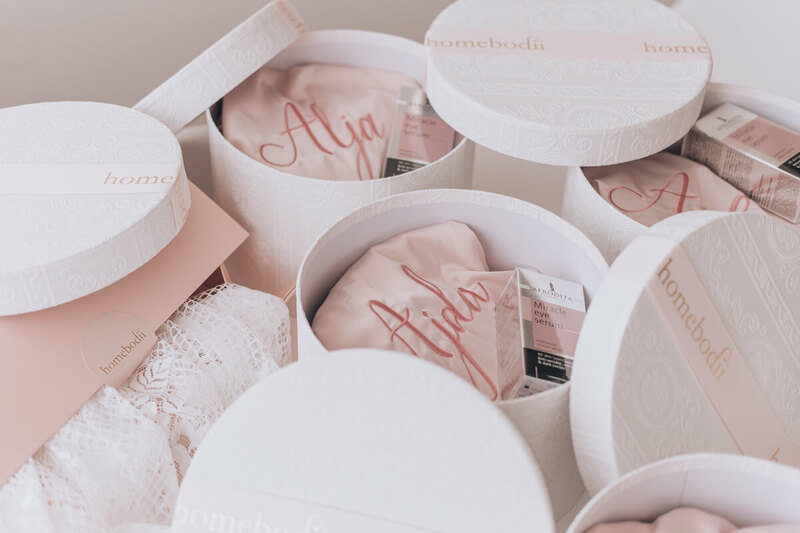 And also since the whole bridesmaid gift box was my little secret, even the name of the skincare range was perfect. 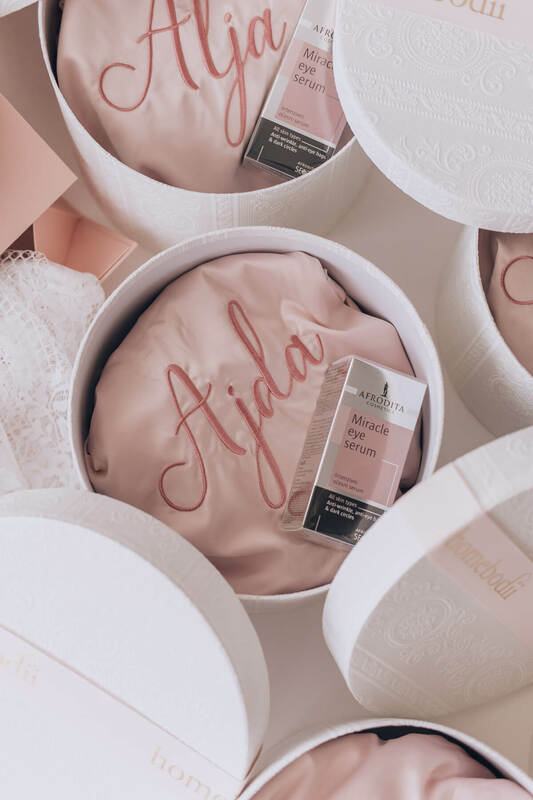 My bridesmaids will be pampering their skin with the following hydrating and protective products: Afrodita’s Secret Anti-Pollution serum, Firming moisturising cream and Miracle eye serum. I’ve been also using the trio for a week now and it’s safe to say products are really lovely, hydrating, working well under my makeup and perfect for upcoming warmer days. They make a great gift idea, since they work well on different skin types. And they look super cute, did I mention that already? 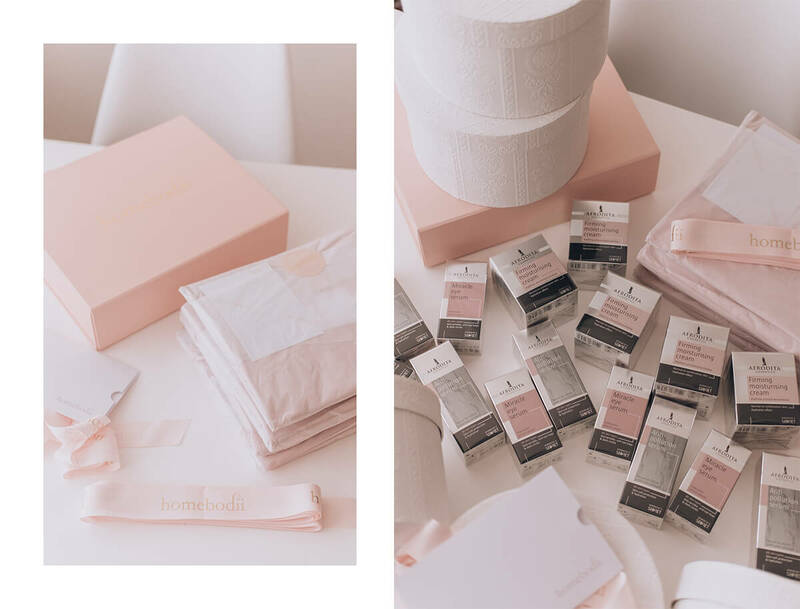 I wanted to gift and pamper my bridesmaids with something special and useful. 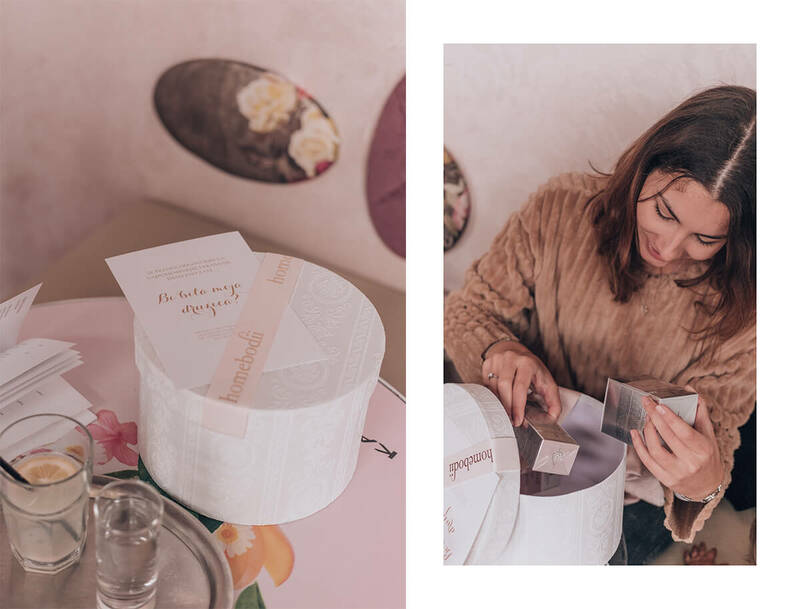 They were all really surprised and excited about the inside of their gift boxes – personalized bridesmaids robes and a set of skincare products, while reading the card there was also a tear of joy or two… Dear bridesmaids of mine, thank you for being there for me in the past and today. I cannot wait for our future adventures. Love you all! Mislim, da sem lihkar doživela estetski orgazem. Prelepo! Wow!